Summary Organizations in the United States alone spend billions on training each year. These training and development activities allow organizations to adapt, compete, excel, innovate, produce, be safe, improve service, and reach goals. Training has successfully been used to reduce errors in such high-risk settings as emergency rooms, aviation, and the military. However, training is also important in more conventional organizations. These organizations understand that training helps them to remain competitive by continually educating their workforce. They understand that investing in their employees yields greater results. However, training is not as intuitive as it may seem. There is a science of training that shows that there is a right way and a wrong way to design, deliver, and implement a training program. The research on training clearly shows two things: (a) training works, and (b) the way training is designed, delivered, and implemented matters. This article aims to explain why training is important and how to use training appropriately. Using the training literature as a guide, we explain what training is, why it is important, and provide recommendations for implementing a training program in an organization. In particular, we argue that training is a systematic process, and we explain what matters before, during, and after training. 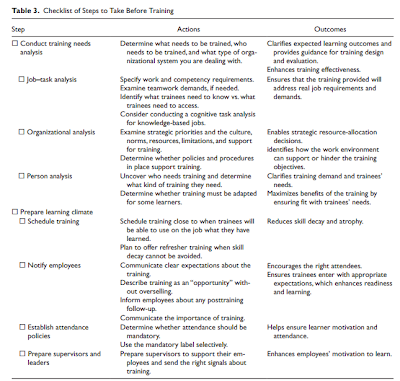 Steps to take at each of these three time periods are listed and described and are summarized in a checklist for ease of use.We conclude with a discussion of implications for both leaders and policymakers and an exploration of issues that may come up when deciding to implement a training program. Furthermore, we include key questions that executives and policymakers should ask about the design, delivery, or implementation of a training program. Finally, we consider future research that is important in this area, including some still unanswered questions and room for development in this evolving field.